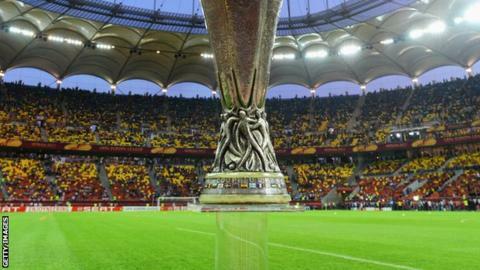 Tottenham will face 1998 finalists Lazio in the group stage of the Europa League, after the draw was made on Friday. Andre Villas-Boas's side are in Group J and will also play Panathinaikos of Greece and Maribor of Slovenia. Liverpool are in Group A, along with Italy's Udinese, Swiss side Young Boys and Russian side Anzhi. Newcastle will play in Group D with France's Bordeaux, Club Brugge of Belgium and Maritimo of Portugal. Tottenham were denied a Champions League spot despite finishing fourth in the Premier League after Chelsea's Champions League victory. Liverpool were also handed a tough draw. Udinese finished third in Serie A last season, while Russians Anzhi, who are coached by Guus Hiddink and captained by former Inter Milan striker Samuel Eto'o, secured big wins over Dutch sides Vitesse and AZ to reach the group stage. Defending champions Atletico Madrid are in Group B with Hapoel Tel Aviv, Viktoria Plzen and Academica, while runners-up Athletic Bilbao face Lyon, Sparta Prague and Ironi Kiryat Shmona in Group I.
Italians Inter are bidding for a fourth title and are grouped with Rubin Kazan, Partizan Belgrade and Neftchi Baku in Group H.